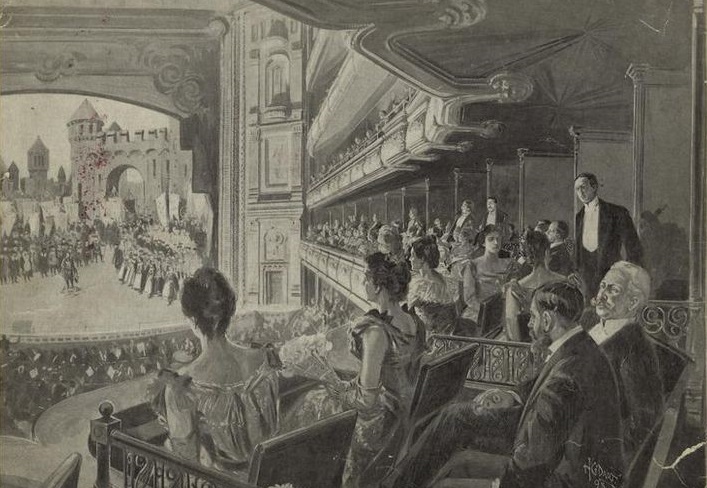 Patrons at the Metropolitan Opera House in 1898 watching a scene from a performance of Die Meistersinger. Courtesy New York Public Library Digital Gallery. Opera was Cather’s lifelong passion. She went to see performances at every opportunity—and particularly anything staged by the New York Metropolitan Opera Company. She had first seen them on tour when she visited Chicago in 1895. During her years in Pittsburgh, from 1896 to 1906, she made frequent trips to New York and went to the old Metropolitan Opera House on Broadway, and when the Met came to Pittsburgh in 1898, she caught two Wagner operas (Lohengrin and Die Walküre). “A Wagner Matinée” (previously presented to Story of the Week readers) combines Cather’s two favorite subjects—music and frontier living—and depicts a Nebraskan settler who returns to the East and attends an opera, reminding her of everything she has given up to live a life on the prairie. Published the following year, in 1905, “The Garden Lodge” is similar in theme but relocates the place of exile from Nebraska to Wall Street; there is neither prairie nor farm in this story. The musically-inclined Caroline Noble, having suffered as a young woman through bohemian poverty and familial tragedies, marries a business tycoon and tosses aside her artistic talents in favor of a “happy, useful, well-ordered life.” Like the Nebraskan pioneer in “A Wagner Matinée,” Caroline begins to question her choices because of the opera—in this case, when a world-famous Wagnerian tenor stays for a month in her home. With its droll wit and urbane social commentary, this early story showcases a noteworthy literary influence on Cather’s early fiction. At the age of twenty-one, Cather published in her local Nebraska paper a tribute to the “one English speaking author who is really keeping his self-respect and sticking for perfection. Of course I refer to that mighty master of language and keen student of human actions and motives, Henry James.” Sharon O’Brien, the editor of The Library of America’s Willa Cather editions, writes, “Cather would always say that as a beginner she ‘laboriously’ strove to imitate Henry James. The influence had some benign after-effects, but it certainly made for artificiality early on.” Yet, O’Brien adds, “The Garden Lodge” is “less artificial” than Cather’s other Jamesian stories, and the story contains strong hints of the novels she wrote during the next decade, including Alexander’s Bridge and The Song of the Lark. Notes: There are several references to Wagner’s operas in the story. On the opening page, there is a mention of Freya, the Norse goddess of fertility and a character in Das Rheingold. Klingsor’s garden (p. 53) is an enchanted garden created by the evil magician Klingsor in Parsifal. Die Walküre (p. 58) is the second opera in the four-opera cycle Der Ring des Nibelungen, about the passion of reunited brother and sister Siegmund and Sieglinde. When Caroline Noble's friends learned that Raymond d'Esquerré was to spend a month at her place on the Sound before he sailed to fill his engagement for the London opera season, they considered it another striking instance of the perversity of things. . . . If you don't see the full story below, click here (PDF) or click here (Google Docs) to read it—free!